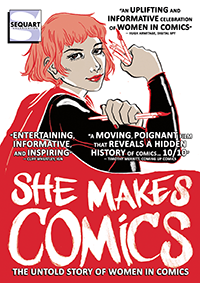 On 15 November, 2014, Respect Films and Sequart hosted the world premiere of She Makes Comics at Brave New World Comics in Santa Clarita, CA. We screened the documentary for over one hundred attendees and held a lively and insightful panel afterward, featuring several of the film’s interviewees: Joyce Farmer (underground comics artist), Lauren Bregman (cosplayer and owner of Castle Corsetry), Tiffany Smith (host of DC All Access), Jenna Busch (comics writer and journalist), and Shannon Watters (editor at BOOM! Studios). It was truly a spectacular night, and we put together a little video to share with you. Enjoy! 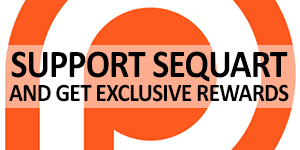 For information on how to order all of Sequart’s documentaries, please visit the Sequart store. Tagged Respect Films, She Makes Comics, women in comics. Bookmark the permalink.